Ever wanted to be a superhero? All you need is a pair of dice, this book, and imagination! Steamlined rules make it quick to make a hero, and easy to play. Customize dozens of powers to make any sort of superhero from low-powered mystery men to cosmic heroes who defend the galaxy. 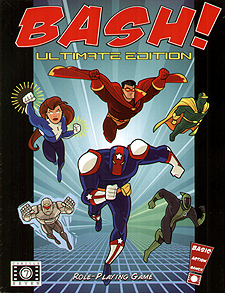 Play in a variety of eras and settings, such as the Golden Age or Silver Age of comics, sci-fi superheroes, and more. Dozens of pre-made archetypes let you quickly create heroes and villains so you can just pick up and play.